Yesterday afternoon, the new facebook became the only facebook. I am usually someone who loves change, but I find myself not enamored by the new look and feel. Guess I am getting old. Well as I was perusing facebook, I realized I had hit 800 friends. Now that made me smile. Back in July we did a service on "Choosing Friends Wisely" from Proverbs and as part of the message, I asked people to be my friend on facebook. I had 291 at that point in time. So thanks to everyone who has said yes to being my friend. If you are part of Restore and haven't joined facebook yet, sign up and become a fan of Restore Community Church...Oh yeah, and become my friend too. 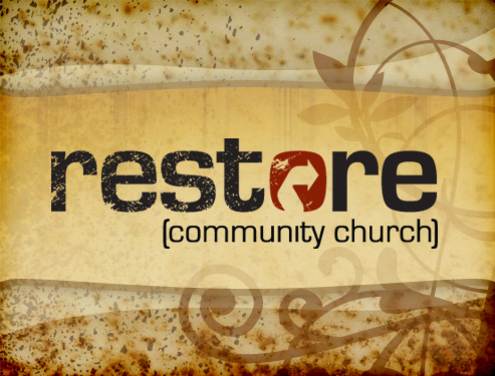 Tommy Bowman and has been working with on consistently getting the Restore message up as a podcast each week. If you are interested, you can get it off the Restore website here. And now beginning this week, you can also get it free from iTunes. You can easily subscribe by going to iTunes and searching on Restore Community. Check it out and subscribe. After much delay, I am entering the dark, dark world of twitter. So many speak so highly of this form of rapid communication, but for a person so easily distracted by whatever is new....I sense my resistance to addictive tendencies may fall prey to this form of constant chatter. I think I will begin to live vicariously thru others.....Dave Ferguson, Scott Hodge, Mark Batterson and others...I am now living your lives!! I am so proud of Tommy and Janet who provided the staff leadership (and lots of extra hours) to make this happen. They have worked closely with the team from Church Plant Media who have been a great asset.